The reduction in the purchasing power of a currency. Inflation has historically occurred when a country prints too much of its currency in too short a period of time. Central banks attempt to control inflation by raising interest rates when necessary, which decreases the amount of money in circulation. Inflation is inevitable whenever wealth is created, but central banks attempt to keep it between 2% and 3% whenever possible. See also: Deflation, Disinflation, Inflation tax. A general increase in the price level of goods and services. Unexpected inflation tends to be detrimental to security prices, primarily because it forces interest rates higher. A point to keep in mind is that a certain amount of inflation is already embodied in security prices. Compare deflation. See also consumer price index, core inflation, cost-push inflation, demand-pull inflation, GDP deflator, producer price index, purchasing power risk. Inflation is a persistent increase in prices, often triggered when demand for goods is greater than the available supply or when unemployment is low and workers can command higher salaries. Moderate inflation typically accompanies economic growth. But the US Federal Reserve Bank and central banks in other nations try to keep inflation in check by decreasing the money supply, making it more difficult to borrow and thus slowing expansion. Hyperinflation, when prices rise by 100% or more annually, can destroy economic, and sometimes political, stability by driving the price of necessities higher than people can afford. Deflation, in contrast, is a widespread decline in prices that also has the potential to undermine the economy by stifling production and increasing unemployment. Fig. 46 CPI annual percentage change. Source: Office for National Statistics. An increase in the general level of PRICES in an economy that is sustained over time. In the UK the rate of inflation has been measured since December 2003 by a CONSUMER PRICE INDEX (CPI) in order to bring it into line with European Union practice which uses a ‘harmonised index of consumer prices’ (HICP) to provide a common formula for calculating inflation rates for EU member countries. Formerly the UK measured inflation rates in two main ways: the RETAIL PRICE INDEX (RPI all items) the ‘headline inflation rate’, and the Retail Price Index (RPIX) which excludes mortgage interest payments – the ‘underlying inflation rate’. The CPI is now used to monitor the inflation rate for purposes of applying the government's macroeconomic policy in general and MONETARY POLICY in particular (see RETAIL PRICE INDEX). Fig 46 shows movements in these three indices over the period October 1999 to October 2001. Because of the distorting effects of inflation on the functioning of the economy and the harm it does to certain sections of the community (particularly those people on fixed incomes), most governments accord a high priority to the control of inflation when formulating their ECONOMIC POLICIES. an increase in input costs – wages, raw materials and components – which ‘push up’ final prices (cost-push inflation). According to the monetarist school (see MONETARISM), demand-pull inflation is caused by the excessive creation of money and they prescribe strict controls on the MONEY SUPPLY as a means of reducing excess spending (see MONETARY POLICY). Likewise the Keynesian school advocates cuts in spending as the way of tackling excess demand, but in their case mainly by increasing taxes and reducing government expenditure (see FISCAL POLICY). Cost-push inflation tends to be associated particularly with excessive increases in money wage rates (i.e. wage rates greater than can be paid for by increases in the underlying rate of productivity growth) and with occasional explosions in commodity prices (the OPEC oil price increases of 1973 and 1979 being a case in point). Cost-push inflation caused by excessive wage demands can be modified or eliminated either directly by the use of controls on prices and incomes or more indirectly by ‘moral suasion’ and measures to reduce the monopoly power of trade unions. In the past most UK governments have not formulated monetary policy with any specific inflation ‘target’ in mind. The present government, however, has committed itself to an annual inflation rate target of not more than 2%, and the remit of the MONETARY POLICY COMMITTEE at the Bank of England is to set official INTEREST RATES so as to achieve this target. The ‘thinking’ behind this strategy is that a low inflation economy is essential in order to create stable monetary conditions and thus lower unemployment. Likewise, in the European Union (EU) the EUROPEAN CENTRAL BANK (under Maastricht Treaty ‘convergence’ criteria for ECONOMIC AND MONETARY UNION) has set an average EU-wide inflation rate target of not more than 2%. In general the business community dislikes inflation. It is administratively inconvenient and expensive constantly to change price lists and allow for the effects of inflation on firms' cashflow positions and the valuation of assets (see INFLATION ACCOUNTING). A more important consideration is the effect of inflation on firms' competitive positions in the domestic and overseas markets against foreign rivals. Specifically, high rates of inflation, unless offset by compensatory EXCHANGE RATE movements, have the effect of making imports relatively cheaper and exporting more expensive, thus putting firms at a growing price disadvantage or squeezing their profit margins. See PURCHASING POWER, INDEX-LINKED. (d) Fig. 93 Inflation. 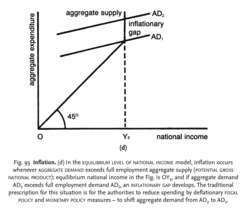 (d) In the EQUILIBRIUM LEVEL OF NATIONAL INCOME model, inflation occurs whenever AGGREGATE DEMAND exceeds full employment aggregate supply (POTENTIAL GROSS NATIONAL PRODUCT): equilibrium national income in the Fig. is OY2, and if aggregate demand AD2 exceeds full employment demand AD1, an INFLATIONARY GAP develops. The traditional prescription for this situation is for the authorities to reduce spending by deflationary FISCAL POLICY and MONETARY POLICY measures - to shift aggregate demand from AD2 to AD1 . (c) Fig. 93 Inflation. (c) Consumer price increases, GROUP OF 7,1981–2003. Source: World Economic Outlook, IMF, 2004. Fig. 93 Inflation. (a) UK Consumer Price Index (CPI), 1996–2004. Source: Office for National Statistics, 2004. 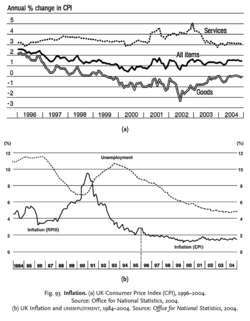 (b) UK Inflation and UNEMPLOYMENT, 1984–2004. Source: Office for National Statistics, 2004. An increase in the general level of prices in an economy that is sustained over a period of time. The annual increases in prices may be small or gradual (creeping inflation), or large and accelerating (hyperinflation). In the UK, the rate of inflation has been measured since December 2003 by a CONSUMER PRICE INDEX (CFI) in order to bring it into line with European Union practice, which uses a ‘harmonized index of consumer prices’ (HICP) to provide a common formula for calculating inflation rates for EU member countries. Formerly, the UK measured inflation rates in two main ways: the RETAIL PRICE INDEX (RPI all items), the ‘headline inflation rate’ and the Retail Price Index (RPIX), which excludes mortgage interest rates - the ‘underlying inflation rate’. The CPI is now used to monitor the inflation rate for purposes of applying the government's macroeconomic policy in general and MONETARY POLICY in particular. Fig. 93 (a) shows movements in the CPI since 1996. Fig. 93 (b) shows changes in the UK's underlying inflation rate (together with the (b) UNEMPLOYMENT RATE and the Consumer Price Index) over the period 1984–2004, and Fig. 93 (c), provides some international comparisons. Inflation reduces the PURCHASING POWER of money (see REAL VALUES). The avoidance of inflation has long been one of the main objectives of MACROECONOMIC POLICY. Inflation is considered to be undesirable because of its adverse effects on income distribution (people on fixed incomes suffer), lending and borrowing (lenders lose, borrowers gain), speculation (diversion of saving away from industry into property and commodity speculation), international trade competitiveness (exports become relatively more expensive, imports cheaper) and unemployment. Hyperinflation is particularly serious because people lose confidence in the use of money for exchange purposes and the economic system is liable to collapse. an increase in FACTOR INPUT costs (wages and raw materials) that pushes up prices (COST-PUSH INFLATION). According to the monetarist school (see MONETARISM), demand-pull inflation is caused by the excessive creation of money, and they prescribe strict controls on the MONEY SUPPLY and higher INTEREST RATES as a means of reducing excess spending (see MONETARY POLICY). Likewise, the Keynesian school advocates cuts in spending as the way of tackling excess demand, but in their case mainly by increasing taxes and reducing government expenditure (see FISCAL POLICY). Cost-push inflation tends to be associated particularly with excessive increases in money wage rates (i.e. wage rates greater than can be paid for by increases in the underlying rate of productivity growth) and with occasional explosions in commodity prices (the OPEC oil price increases of 1973,1979 and 2004 being a case in point). Cost-push inflation caused by excessive wage demands can be modified or eliminated either directly by the use of controls on prices and incomes (see PRICES AND INCOMES POLICY) or more indirectly by ‘moral suasion’ and measures to reduce the monopoly power of trade unions (see UNEMPLOYMENT LAWS). In the past, most UK governments have not formulated monetary policy with any specific inflation ‘target’ in mind. The present government, however, has committed itself to an annual inflation rate target of not more than 2% in the Consumer Price Index, and the remit of the MONETARY POLICY COMMITTEE at the Bank of England is to set official INTEREST RATES so as to achieve this target. The ‘thinking’ behind this strategy is that a low-inflation economy is essential in order to create stable monetary conditions and thus lower unemployment. Likewise, in the European Union (EU) the EUROPEAN CENTRAL BANK (under the Maastricht Treaty ‘convergence’ criteria for ECONOMIC AND MONETARY UNION) has set an average EU-wide inflation rate target of not more than 2%. See INFLATIONARY SPIRAL, PURCHASING POWER, TRANSMISSION MECHANISM, ADAPTIVE EXPECTATIONS HYPOTHESIS, QUANTITY THEORY OF MONEY, INDEXATION, INTERNAL-EXTERNAL BALANCE MODEL, NEW AND OLD PARADIGM ECONOMICS. A loss in the purchasing power of money. Inflation is generally measured by the consumer price index. E]ven now the cosmology community has not taken a cold, honest look at the big bang inflationary theory or paid significant attention to critics who question whether inflation happened," they said. Cyprus: We can see that during the period 2004-2007 the excess inflationary gap exceeds consumer prices growth indicating stagflation for cypriot economy. The reluctance to ease monetary policy in an environment of intensifying inflationary pressure (albeit transitory) will most likely prevent the CBR from cutting interest rates at the forthcoming MPC meeting. Supporting gold's status as a haven from inflationary pressures, crude prices rose as conflict in oil-producing Libya intensified. Saudi Arabia's central bank expects inflationary pressure to continue in the final quarter of 2010 but at a weaker level than before, it said in a report on Monday. The inflation rates vary considerably across the GCC and conditions could change if commodity prices rise again, if the dollar weakens further or stronger recovery in domestic demand fuels inflationary pressures, the IIF report said. 34 percent in the first month (July) of the current fiscal year, indicating inflationary pressures continue to haunt the consumers. Fresh fruit reported the highest inflation rate since April 2009 and meats, oils and fats also all remained inflationary in July. The central bank will endeavour to achieve price stability and anchor inflationary expectations,' he said. This is attributed to middlemen exploiting inflationary expectations. PAY deals in manufacturing firms remain at historically low levels, with no sign of wage inflationary pressures building up, according to a new report.